Hire a Cheap Car in Alghero Now! Your visit to Alghero can be very relaxing, and one of the best ways to explore the beautiful city is a comfortable rental car. 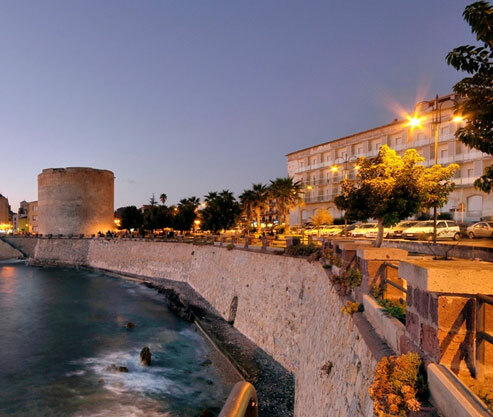 Hire a car in Alghero with us and save big money by pre-booking online. We work in collaboration with the top global car suppliers to bring you the widest range of rental cars at Alghero. In addition to cars in top condition, we also offer beneficial add-ons like navigation systems and extra child seats to make your trip more comfortable. We also offer Collision Damage Waiver and Theft Waiver as part of standard inclusions so that the journey remains easy on your pocket. So, hire a car in Alghero now and make the most of your trip. Alghero, in Sardinia, is a small town close to the Mediterranean Sea. The Catalan language is partly official in the city as a big portion of the local population is descendants of the Catalan conquerors from the Middle Ages. The small medieval city with cobbled streets lined with bars, restaurants, and boutiques and a magnificent setting in sandstone make it a good place to spend time in solace. Alghero has a mild climate due to the closeness to the sea and does not experience extreme temperatures. Alghero also has beautiful sandy beaches along pine tree forests and is one of the best places in Sardinia for an ideal vacation. Also known as the Cathedral of St. Mary the Immaculate, this cathedral officially came into being in 1730 after construction started in 1530. The cathedral was built in a Catalan-Gothic style with a Neo-Classical facade. The building has five chapels and a grand bell tower with an octagonal base. Neptune’s Grotto in Alghero is a stalactite cave, which was discovered in the 18th century. The cave got its name from Neptune, who is the Roman god of the sea. The cave can be reached via a boat trip that begins from the port of Alghero. The place is visited by a large number of tourists every year and guided tours are also available. Built in the 16th century, these walls stand around the perimeter of the city and are a wonderful way to take a walk in solace and enjoy the historic beauty of this place. The pedestrian path along the walls gives a magnificent view of the horizon and is also lined up with restaurants and bars, which makes it an ideal place to have a relaxing time.